I've been reading the poet Mary Oliver recently. 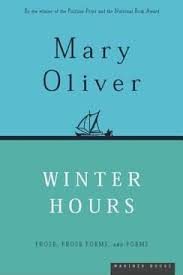 In her book Winter Hours (1999), she reminds me of the importance of eye to eye connection, quoting a line from another poet, Robert Frost: "We begin in infancy by establishing correspondence of eyes with eyes." I think back to each of the births of my three sons and recall how, as each was handed to me in those precious moments after emerging from the womb, I gazed into their eyes. And how they looked at me. Even now, decades later, I can still see their dark eyes and feel our first connection, a meeting of souls. Oliver goes on to write, "It is deeply true. It is where the confidence comes from; the child whose gaze is met learns that the world is real, and desirable -- that the child himself is real, and cherished" (Winter Hours, p. 41). Some years ago, I was invited into a school to coach a primary teacher in the art of oral storytelling. She was nervous. She was much more comfortable, she explained, leading her class of 7 and 8 year olds in the "literacy hour" during which she set a picture book on a wooden stand and read the story to the children, turning the pages while directing their gaze to the pictures in the book. Oral storytelling, of course, is different. It's not about reading but rather about telling to and connecting with the audience; or, as the Traveller proverb goes, telling stories "eye to eye, mind to mind, and heart to heart." I spent the morning coaching the teacher and after lunch, she gathered her children on the rug in front of her. The morning's picture book was still on the stand beside her. I moved it off to the side and invited her to tell the story she had prepared. Still nervous, she began. She had chosen a traditional fairy tale. It had a castle, a prince and princess and a dragon and as she entered into the imaginative world of the story, her voice strengthened. I watched her lean forward, her voice casting the story's spell over the children, her hands and facial gestures weaving the tale together. The children's eyes were focused on their teacher. They were entranced, their imaginations engaged. The story was a success. The children wanted another. "But wouldn't you rather me read another story from the book?" she asked, still a little overwhelmed by the experience. "NO!!" the children shouted with one voice. "Why?" she asked. A little girl raised her hand and said, "Because I liked it when you looked right at me at the part when the princess met the dragon. You made me feel like I was there." Several other children made similar comments. "You looked at me," they said. In our discussion afterwards, the teacher had learned that when reading the book, she was directing the children's gaze away from her and toward the pictures and printed words on the stand. But in telling them a story, she looked directly at them, connecting with them, affirming them, building their confidence and self-esteem, nourishing them with an engaging story. And in return, the children gave her their undivided attention. They opened their hearts and imaginations. Now, I'm not against reading books to children. In fact, I think it's an important part of a child's upbringing to instil a love of books and reading. But not at the expense of telling stories. That "eye to eye" contact is essential to connecting with the hearts and minds of children and reassuring them that they are real and cherished. So to any teachers (and parents) out there who might be reading this, if you haven't tried telling stories to children, give it a go. And if you have time, I'd love to read about your experiences in the "Comments" section below.